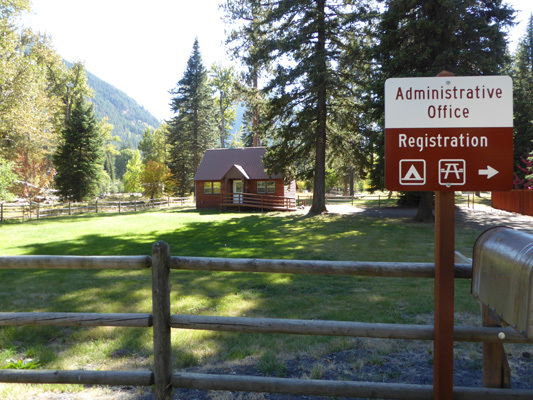 We were site cleaning host at Wallowa Lake State Park in Jospeh, Oregon for the month of September 2016. 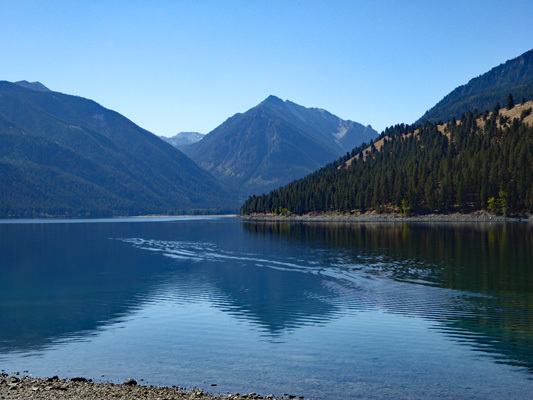 Wallowa Lake is nestled at the base of the Wallowa Mountains in the northeast corner of Oregon. The park has a marina (which closes September 15th) where you can rent kayaks, paddle boats and fishing boats and moorage. 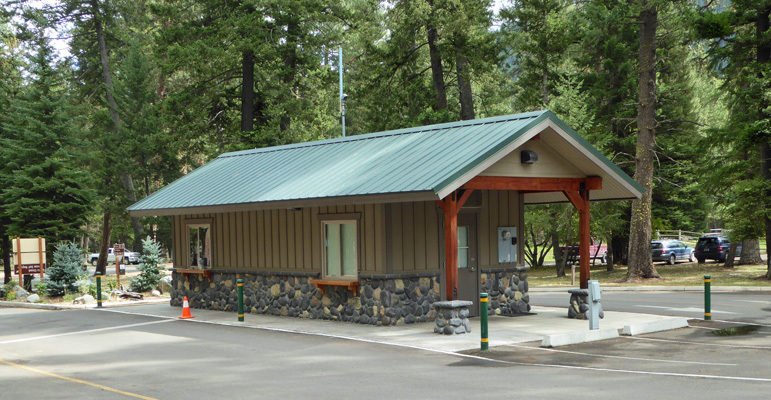 The park is also about a mile north of the main trailhead into the Eagle Cap Wilderness. 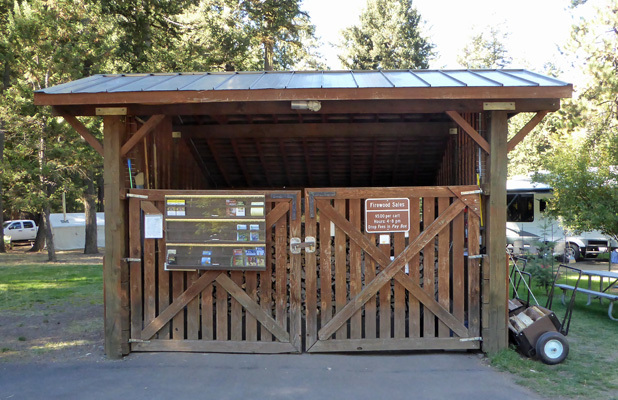 Two major trails leave from this trailhead and several trails branch off of them including the Chief Joseph Trail which is a 2.6 mile round trip. 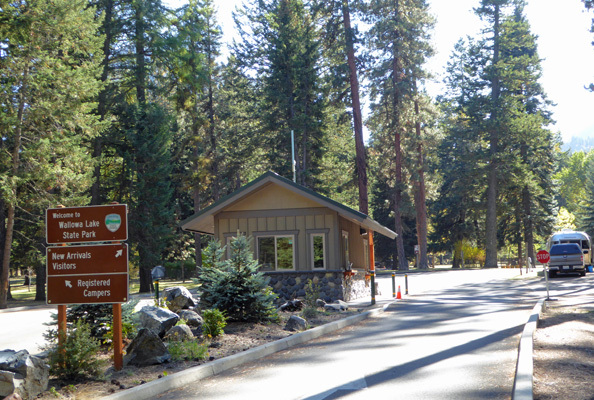 Normally, the campground provides 121 Full Hookup sites, 88 tent sites, 2 hard-sided yurts and a Hiker-Biker campground with 3 or 4 sites. 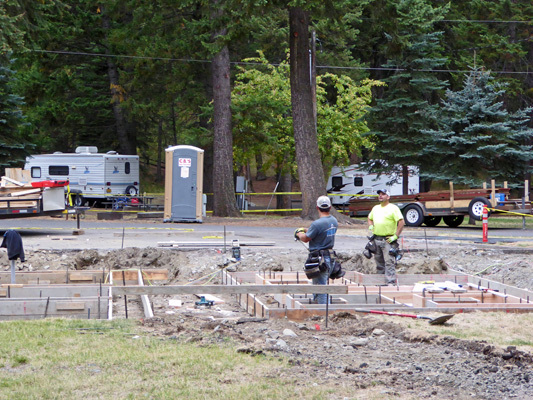 However when we were there, the restrooms in the B and C campground loops were under construction so some of the sites were cordoned off for that purpose. All the sites are normally reservable but because of the construction the bulk of the sites in the B and C loops were first come first served while the A, D and E loops were reserveable up to 9 months in advance. 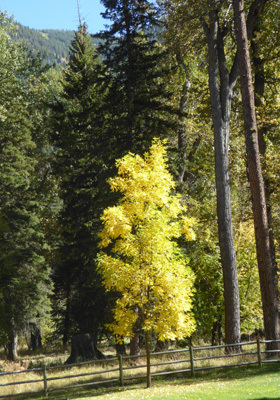 The park is open all year round and the yurts and some of the campsites are reservable all year but most of the park is reservable only in the late spring, summer and early fall. There are a few sites in the A loop that have a bit of a lake view (across the marina parking lot or the grass of the large Day Use Area). 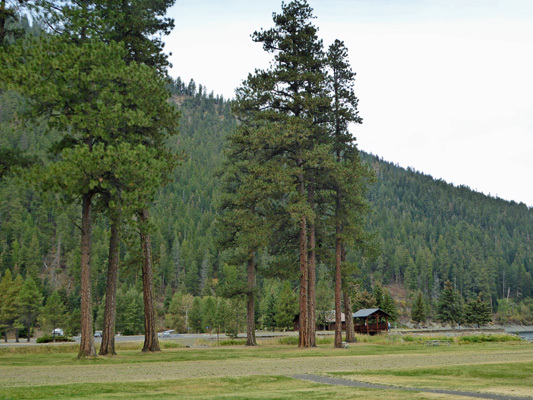 But most of the sites are simply treed with Ponderosa Pines, Douglas Firs and Spruce. 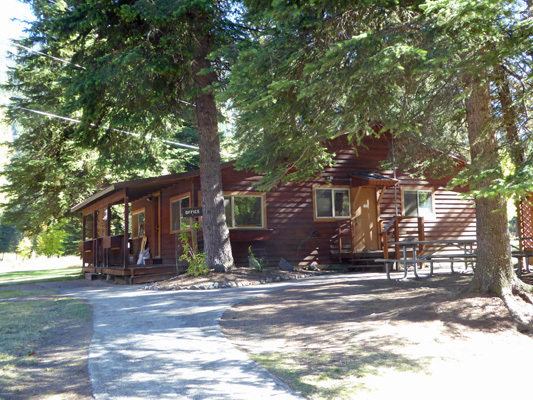 This is a family oriented campground where people come in the summer to fish and play in the lake and in the fall to hike and enjoy the fall color. 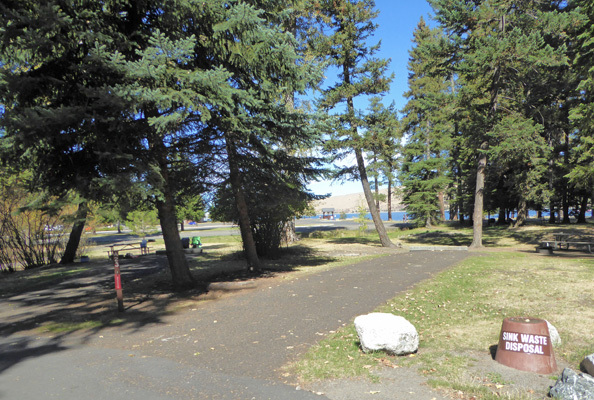 Even with the confusion caused by the construction project, the campground was full for Labor Day and there were very few empty sites the weekend after that. The nights get colder and the weather less dependable as the month goes on and so the campground got less and less full the second half of September. Usually, we are told, all the hook up sites are reserved through September and into October. All of our reservable hookup sites were reserved in September but we had lots of first come first served sites because of the construction. There are spaces for LOTS of hosts in this park. 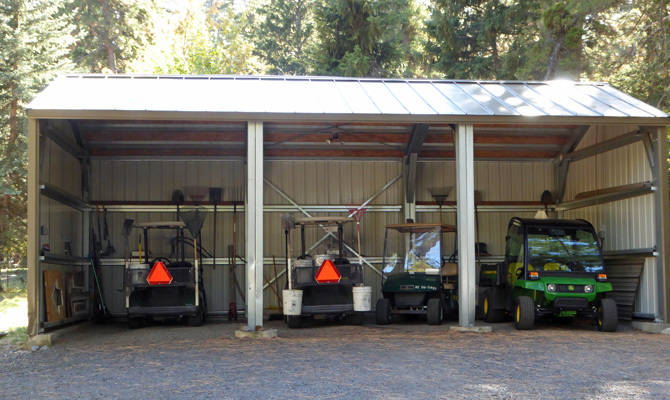 There are 5 hosts sites clustered around the wood shed area. 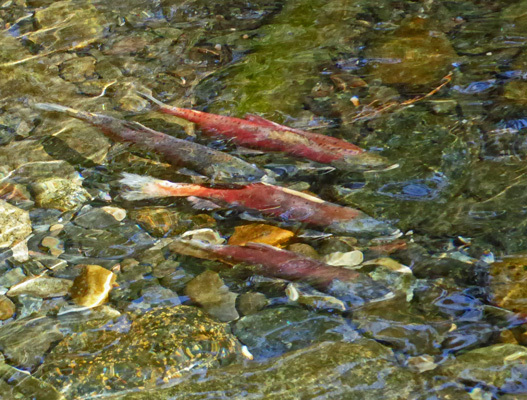 And then there are several more out in the campground loops too (at least 5 more that I know of). We ended up in the host site right at the entrance of the park. This was a fine site in September, though I'm not sure we'd have liked it as much in August when there were many more people going in and out of the park. It certainly didn't have much privacy. You can see that it is literally the first site when you come into the park. People would regularly pull up behind our truck to read the self registration information when the booth was closed (most of the time after Labor Day). And on nice days we'd sit out in the sun and answer questions and help people figure out how to pick a site and how to register. In August, there had been 4 couples and 3 single men hosting here (one of the men was a special projects maintanence host). Often times, one or two of the hosts will simply sell wood each night while the other hosts clean sites or yurts. However, because of all the single men (you really can't handle the wood shed here by yourself) they had split things up so three of the couples sold wood a few nights a week and cleaned sites the other 2 or 3 days a week of their 5-day stint. The hosts had liked that, so in September we had 3 hosts who sold wood 2 or 3 nights a week and cleaned sites 2 or 3 days a week while we were the only hosts who cleaned sites 5 days a week. In addition, we had the special projects host who cleaned sites 2 days a week and worked on projects the other 3 days a week. We worked Thursday through Monday and had Tuesday and Wednesday off. In return, we got our full hookup site for free for the month. At first I was disappointed about not selling wood since I'd thought it would be fun. But in September the evenings get cold fast and you have to sit out by the woodshed from 4 to 8 pm to sell wood. 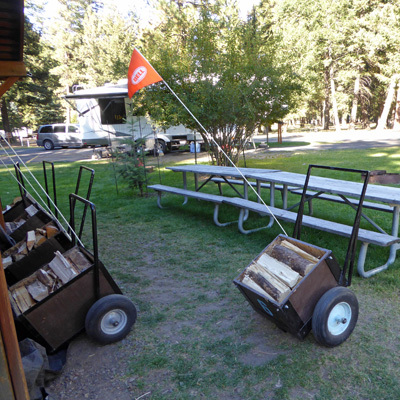 It's fine when your are busy since you have to refill each of the wood carts when campers bring them back after emptying them out. But on a slow night it's just darned cold--and by the end of the month it was dark by 7 pm so you sat around in the dark. On the weekends they sold a lot of wood--up to 60 cart-loads a night. That's a lot of carts to fill. It didn't take me long to realize we'd been spared. During the day the wood shed is closed but you can buy wood via a self serve system. 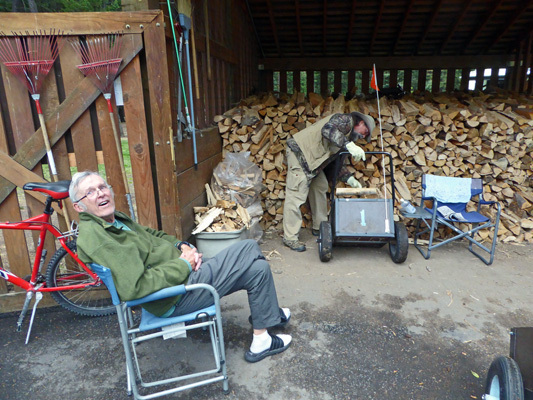 The folks whose host site is next to the wood shed end up refilling carts during the day to keep up with demand (which can be high on cold wet days). You get 2 cubic feet of wood for $5 here--a real deal. And there's usually free kindling available too. Through Labor Day weekend, we had three sets of site cleaning hosts on each day so even when we had 120 sites vacate on Labor Day we only had 40 sites a couple to clean. After Labor Day, several of the August hosts went home (they had stayed through the weekend to help out) and we had two sets of site cleaners every day and three on Friday. That was more than enough even early in the month. The three on Friday was too many frankly. We only had 20 or 30 sites vacate on all our Fridays so we'd alternate who would clean sites and who would find something else to do since doing fewer than 10 sites is just silly. The first half of the month the workload was nearly ideal. We'd clean 25 to 30 sites each day which gave us time for at least one break and often two. Later in the month as usage dropped we were a little bored since cleaning less than 20 sites isn't really enough to do during a 4 to 5 hour shift. 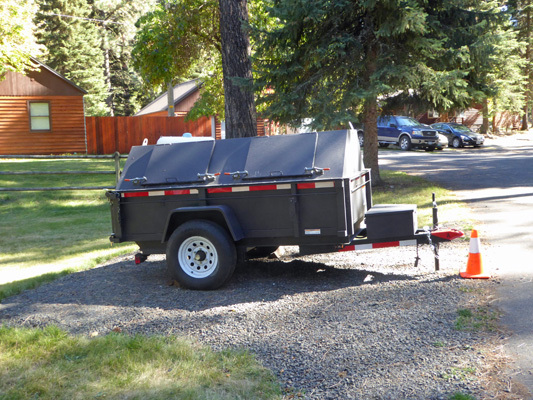 The site cleaning crew starts at 8 am at Wallowa Lake. One host would put up the flag (the wood hosts take it down at the end of the day) and pick up the list of sites to be cleaned at the booth. Then one of us would count up how many there were and divide them up. Most days we then went back to our rigs to wait for folks to start to leave. We'd usually head over to the yard to pick up our cart at about 8:30 to 9 am. 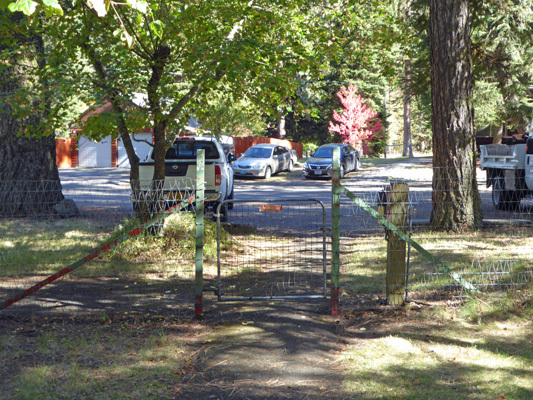 There's a gate in the fence across the drive from the registration booth where you can enter the yard. I would head into the office to get the key for our cart. While Walter made sure the right tools were in the cart. There are 3 golf carts for host use plus a Gator that the seasonals used when they cleaned the restrooms (there are free showers in all the restrooms here). In the summer, they have you leave most of the ash, charcoal and partially burned wood in the fire pits. But in September, we worked our way through all the fire pits, cleaning them out down to the dirt for the winter. That also gave us more to do the first half of the month. We'd usually have sites in 2 and a half loops. We'd start the day driving the loops and usually we'd find 1/4 to 1/3 of the sites vacated so we could clean them. Since they don't usually dig out the fire pits they only provided us with one metal bucket so when that got full we'd circle back to the yard and dump it in the ash dump. They had to tow this to the landfill outside of Joseph to dump it so they let it get pretty full. As a result, we'd have to dig around with a shovel to make room for more ash once it was about 3/4 full. Walter would patrol each site for litter (mostly micro litter but occasionally there would be a few pieces of actual litter) and dog poop. 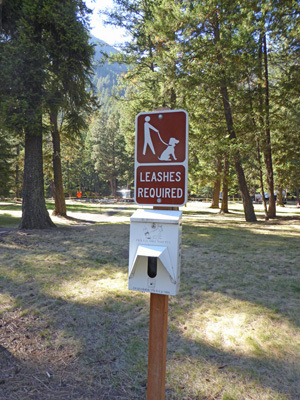 The park provides dog poop bags at a number of stations both in the campground and in the day use areas. But people still don't always pick up after their pets. Meanwhile I'd pick the trash out of the firepit and then dig out the ash. 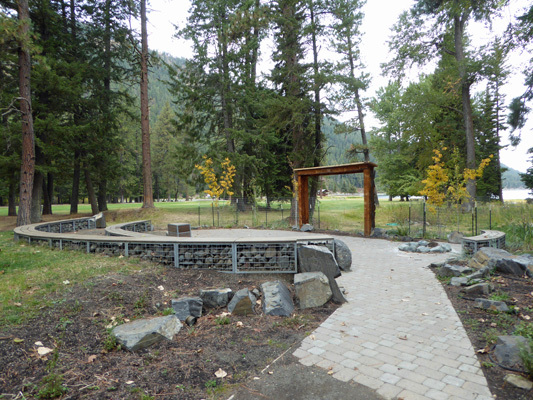 Many of the firepits at Wallowa Lake have been set in concrete so they had a nice solid bottom and were easy to dig out. Others were coming to end of life and had bits of metal to get in your way but it was still not a big deal. Very few folks left their fires going (maybe one a day but more on Sunday it seemed) so we didn't have that challenge to deal with that had been a big problem for us at Harris Beach. Once the firepit was empty we'd rake around it and perhaps sweep off the parking pad if it had lots of debris. Most days (except Sunday when there would be more) we only had 20 to 25 sites to clean and as the month went on that number got lower and lower. The flow of work was such that we'd clean about 1/3 of the sites, then go inside to warm up (it was in the low 40's in the morning the 2nd half of the month) and then we'd do another 1/3 and come back in and then we'd wait until 12:30 or so (often we'd just have lunch) and then go back out to pick up the sites that were last to vacate. Rarely did anyone lollygag past check out time (it was way better than it had been at Harris Beach) and if no one was around we weren't expected to wait for them to show up and vacate. So most days we were done before 1:30. On sunny days, we'd sit outside during our breaks and help people at the self registration station (which was very confusing because of the construction). In fact, several busy Thursday afternoons when the booth was closed we had a great time helping folks. Our site had no Camp Host sign so no one every knocked on our door and asked for help. So helping at with self registration was purely optional and something we did because we enjoyed it. Since in September there were fewer staff out in the campground loops (the number of seasonal workers slowly dropped across the month) campers often stopped us to ask questions. Some would be regarding reservations or sites and if it was before 10 am we'd send them to the booth which was always open then. Most of the rest of the questions we could answer and it was nice to have a bit of camper contact. The two biggest issues we had with site cleaning here were 1) it was COLD in the morning and if it was cloudy it stayed that way and 2) the workload was a little too light in the second half of the month. We dealt with the first issue with long johns, extra fleece and taking breaks every 45 minutes to an hour to warm up. The second issue was the worst on Fridays when we had 3 hosts so we simply found other tasks to do (one week we dug out all the firepits in the sites that were closed due to construction) or asked the maintanence staff for suggestions. The host coordinator was on late shift during September so she didn't come in until we were done with our day so it wasn't easy to confer with her about other options but the rest of the staff stepped in to help us find things to do. 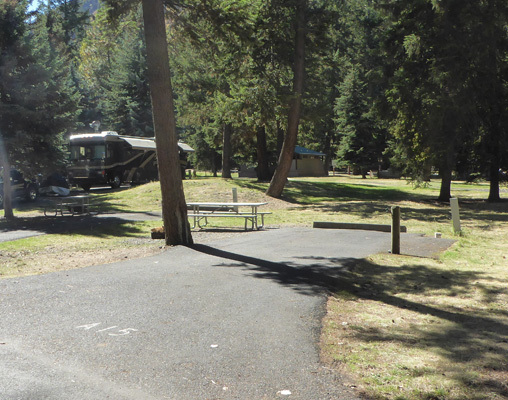 The campground is nestled in mixed forest with most campsites opening out into grassy areas. There is little privacy to the sites so it can feel pretty crowded when it's full. 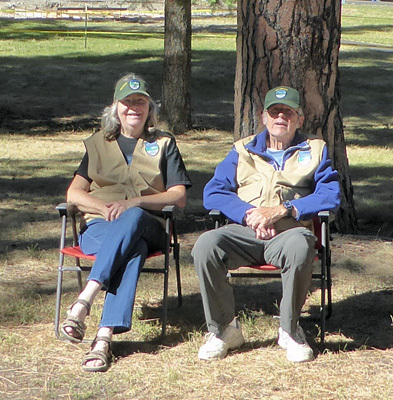 But in September most of the campers were older couples and it was very quiet and peaceful. 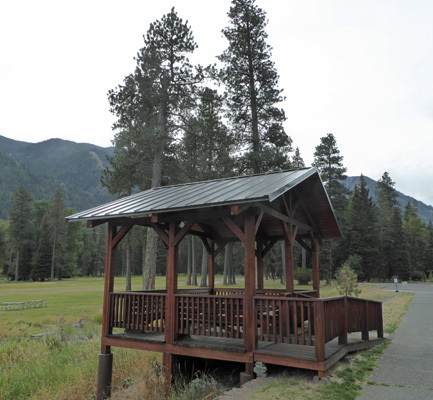 There's a large day use area along the Wallowa River with a picnic shelter and the new interpretive area where they hold evening programs and junior ranger events. Junior Ranger ended at Labor Day and the evening programs were only on the weekend in September. There is a large open grassy area in the Day Use Area. And there's a nice viewing platform where you can see the Day Use area one way and the lake the other. It's a very nice little building and when the lake is higher the water comes right up next to it. 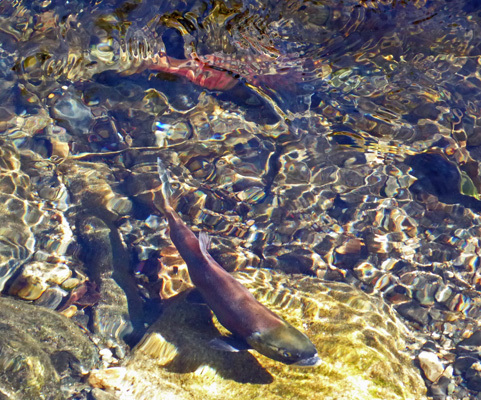 The Kokanee (land-locked salmon) were spawning in Wallowa River south of the lake and you could see them at the bridge by the Day Use Area most of the month of September. This big guy posed in front of rock for me one day. 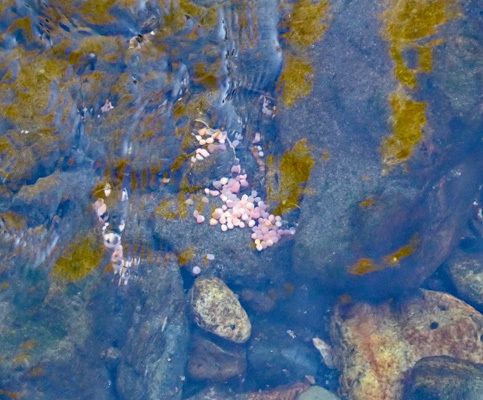 Late in the month we even spied an egg mass in the rocks. 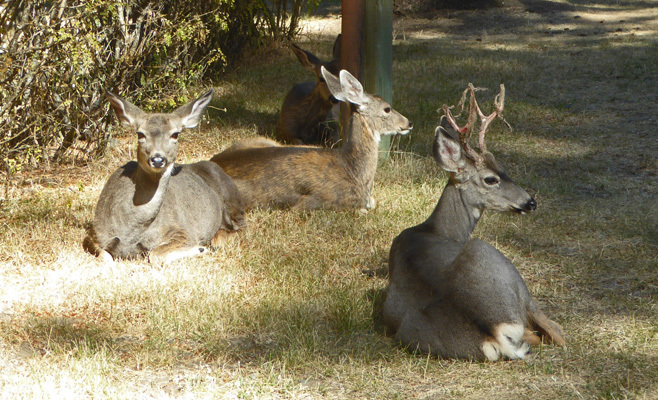 There have always been a lot of deer at Wallowa Lake State Park. Over the last few years the herd has been reduced because they have become ill due to all the people-food campers have fed them (marshmallows etc). 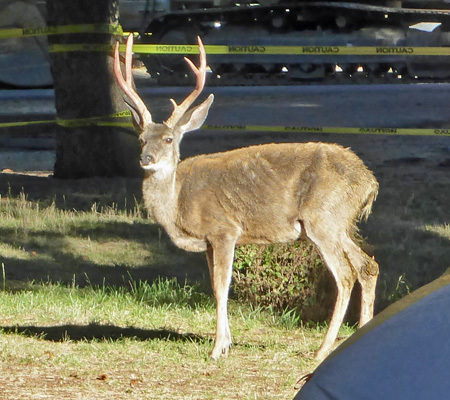 But there were still healthy deer who came through including this lovely buck who came and posed for us one morning. He shows some signs of not being totally healthy but he wasn't sick with mange like some of them. And we had a family of 3 does and a young buck who moved back into the park when the number of campers dropped mid month. There's a lot of do in the area. 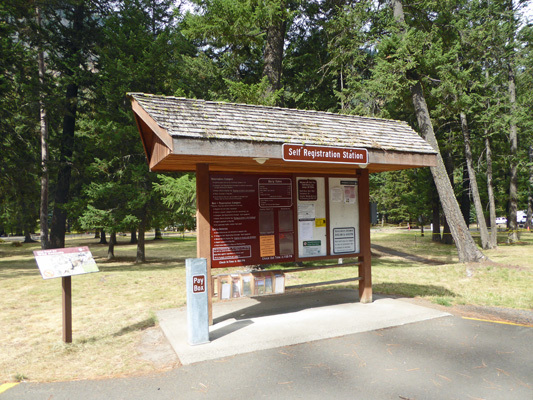 The Wallowa Lake Tramway is a 1/2 mile drive or walk from the registration booth. It takes you up Mt Howard, rising 3700 vertical feet to an elevation of 8150 feet. There are hiking trails and a deli at the top. It runs all summer and closes at the end of the first weekend in October. It's pricey ($31 for adults, $28 for seniors) but the view is fabulous and lots of folks insist on doing it. It consists of gondola cars that seat 4 people. The ride takes 15 minutes to get to the top with the cable stretched over 25 towers. We didn't take the ride but we enjoyed watching the gondoles reach the top when we hiked the Chief Joseph Trail. 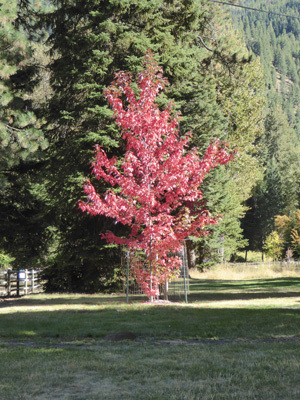 There is lots of hiking in the area both from the Wallowa Lake trailhead and the Hurricane Creek Trailhead (just to the west of the town of Joseph) and from the Lostine River south of Lostine (about 15 miles west of Joseph). The Eagle Cap Wilderness is a backpackers mecca and attracts both day hikers and backpackers. The town of Joseph is a great little tourist town. 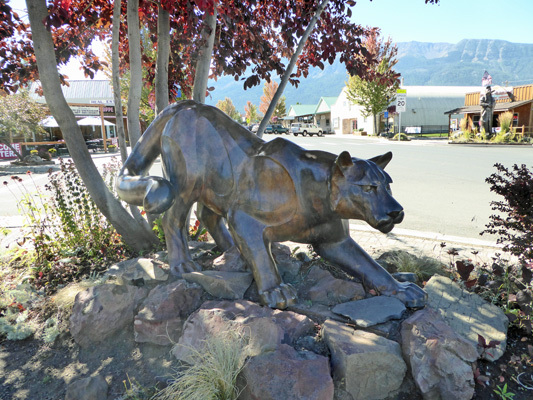 There are lots (more than a dozen) of bronze statues along the main street. And there are lots of brew pubs and restuarants to explore too. There's a Laundromat (without a sign) on the south end of town next to car wash. The grocery store is small so we drove 6 miles further north to Enterprise where there's a nice Safeway grocery store. There are nice Ace Hardware stores in both Joseph and Enterprise. 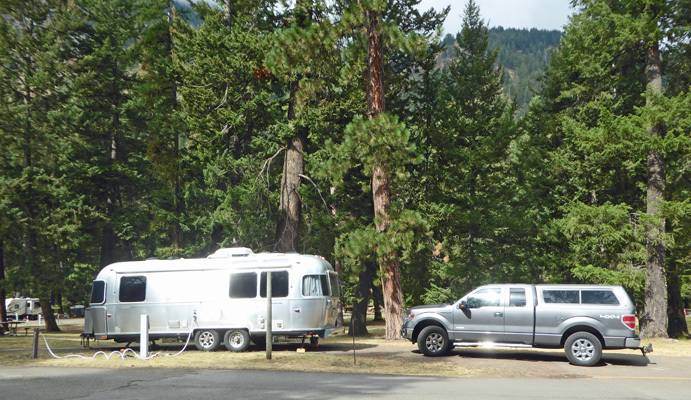 You can also easily drive to explore the viewpoints overlooking Hell's Canyon to the east. We did the drive to Buckhorn Viewpoint while other hosts drove the 10 miles of bad dirt road (10 mph and 16% grade) to Hat Point. Just going to the Day Use Area on the north end of the lake (up near Joseph) will give you an iconic view of the lake and the mountains. There was no internet service in the park. While Verizon phones may work on voice (ours went to roaming and never would complete a call) very little data service was available and most folks smart phones didn't work. There is one pay phone in the Day Use Area. We went to town to use our hot spot. Though it didn't work well at the Day Use Area that is on the north end of the lake, it did fine in the town of Joseph. One week we went to the library in Enterprise to use their Wi-Fi. They charge $2 a week for the password (not a big deal since we shared it across our two computers) but it's a small library and we ended up having to sit at the kiddie table--not real comfortable. It's also only open Monday through Thursday though we did use the network on Friday as we sat in our car in front of the library. We discovered that there was an open network available across the street from the Laundromat in Joseph so we'd use that while we did laundry and to pick up our email from time to time. 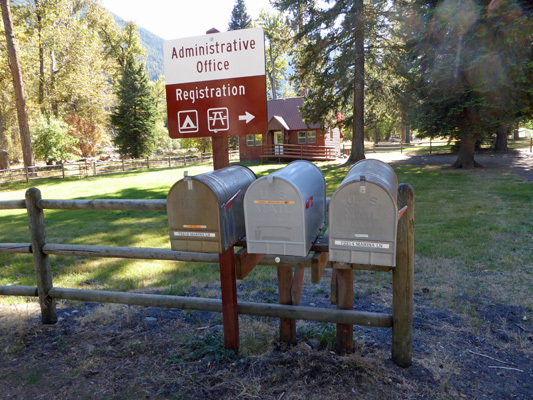 The park has a mailbox dedicated to hosts so you have a physical address you can use while there. It's located on the road between the entrance and the registration booth. If you're not comfortable with an unsecure mailbox you can have mail sent to General Delivery at the Post Office in Joseph. UPS and FedEx will deliver to the Adminstration Office (where the manager and her admin work) and if the package doesn't fit in the host mailbox they'll keep it in the office or take it to the rangers office in the yard but otherwise they put it in the mailbox. UPS doesn't deliver to General Delivery so beware of companies who always ship UPS if you try to use General Delivery instead of the street box. The fishing in the lake is good we've been told. One of the other hosts caught a 15" trout on his first day of fishing in September and continued to catch more than he could eat for the bulk of the month. This was an enjoyable place to work. 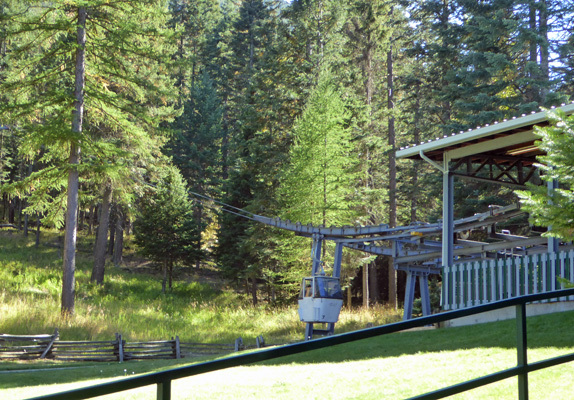 The staff was friendly and helpful and the park was well staffed even in September. The group of hosts we worked with were friendly and easy to work with. We had a full 2 hour orientation when we arrived (something we have only had one other time in Oregon) and they provided lots of useful information, though not in a notebook--they just gave us a pile of paper. The workload the first half of the month was nearly perfect as was the weather. The second half was a little slim and we had a week of cloudy wet cold weather that didn't help the situation. We opted to work here in September because we didn't want to be here when they were full since this is such a dense campground. We think that was a good choice for us even if that meant we were a little bored the last week. Copyright Winterhaven Press 2016 All rights reserved.